Trainer's knowledge and experience with every nook of Excel were highly impressive. The course was properly structured in terms of content, assignments and the flow of the training. I am happy to be using most of Excel Formulae for my operational reports. One quick thing, it would be superb if you could have 1 consulting or brainstorming session post the training to make sure we are using required Excel features for the given scenario. Good sessions. Highly passionate trainer. Sami was quick enough to identify the skill sets and the knowledge of the participants to pace his training accordingly. His way of simplifying the coding concepts was just spell bounding. He knew his students so well that before even we could tell him we are stuck or the code is throwing error, he would ask us to check so and so and the error gets fixed. His experience in this field is shown with the way he approaches each concept. Good learning experience. - Yes!, programming was fun with Sami. Also, I am happy to share that my Live Project is been recognized by my Team Lead paving me way to the greater endeavors ahead. Looking forward to Powerpivots! Thanks Sami & Team"
To sum it all, It was one on the finest sessions I've come across recently. Thanks, Sami! I am been able to approach Excel scenarios more confidently. I kind of enjoyed your Dashboard session the most. I will surely share some work of mine soon to you. Cheers! Learning can be made really simple when you have trainers like Sami & Andrew, who can just make you good with Excel. I truly appreciate your efforts on giving us exciting assignments to reinforce our learning. I kind of liked my whole learning process with you both. Looking forward to seeing you for PowerPivot. I have enjoyed taking up challenging assignments in class. 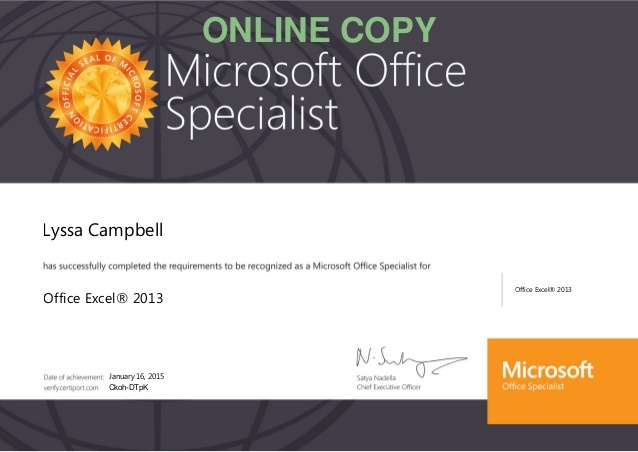 Looking forward to get more of it on a weekly basis to keep me always active with Excel concepts. Since the classes are highly informative, I would insist on planning 6-7 sessions instead of 5. I would like to highlight the patience level of Mr. Sami throughout the sessions. Highly appreciable. Concrete examples, concrete assignments and excelling learning process. Time flew by! Thanks, Andrew. What I learned in the course is when to use what formulae. This greatly helped me to structure my worksheet in a required format and come up with some wonderful visual analysis. Thanks, Sami! It was some really good session. Highly informative sessions and remarkable training skills. A topic that can be slightly tedious at times was made very interesting - great course! Thanks Sami. The course was very well paced and delivered in a manner that was easy to absorb. Enjoyed working on Assignments. I would like to thank Sarah, my manager, to put me on to it. I had received encouraging feedback from my Colleague Ben about Excelgoodies and as such I made an inquiry for Advanced Excel Course. Thanks Ben for referring it to me. Good course, well thought out agenda, engaging assignments and a passionate trainer. I cannot praise the Instructor highly enough. Pacing, delivery, passion for the subject and level of knowledge is excellent. 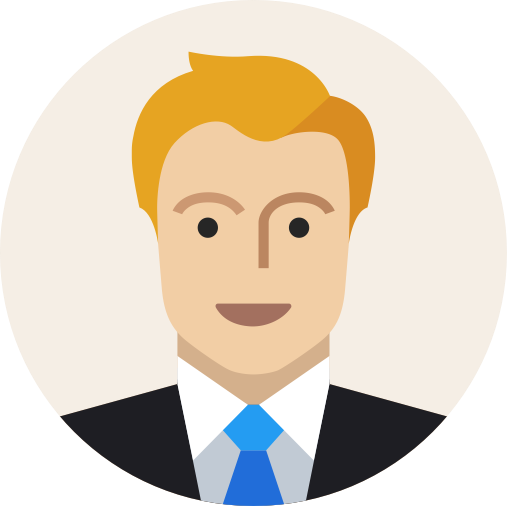 He has extensive knowledge of possible Excel techniques that could be applied and encouraged application to our existing environments. Sami's style of delivery is the best I have ever experienced. He was lively, very knowledgeable and went above and beyond to introduce examples in order to support knowledge intake. I am happy to be certified! Thank you, Sami, for being highly patient in teaching complex formulae. Your art of teaching is something I would always cherish for a long time. You have certainly set the benchmark of teaching standards. Assignments are something which has truly sharpened my Excel skills. Thanks for being awesome! The format of the course was good. Assignments after every 15-20 topics reinforced my learning. Shortcut Tool is something I find really interesting at work. Good work team! One quality of Sami that I would like to highlight is - he was considerate of all training levels and made sure we were all taken care at our own speeds. I am amused at his patience level and truly respect the passion he carries toward his training profession. It was a nice learning experience. Kyle was knowledgeable and patient with all the participants. Learning space was just apt. Loved working with assignments. It would be good if you could send me more of Marketing related assignments. Thanks, Kyle! Informative workshop! It has substantially enriched my knowledge and added value to my Career Profile. I really appreciate the way Instructor go out of the way to help us understand the topics. I come from a non-programming background yet, the topics were taught in the most laymen language making it a child’s play. I feel so happy to write the coding all by self and automating my various day-to-day tasks. The program was the right balance of relevant..
A well-structured program. The flow of training was carried out pretty well by the tutor. Enjoyed working with case studies and the concepts were taught in the simplest way. Every session was equally information and intensive. Intensive course and an awesome trainer to deliver it beautifully. Case studies and the live project at the end of the course has given me the real hang on automation. It has added a new dimension to my finance career profile. Thanks, Sami! for being such a wonderful tutor. Comprehensive program with loads of case studies yet a very simple learning approach. Every automation I do, I learn new things. It feels awesome to become the one point destination for all my teammates to automate stuff. All best wishes to Sami. Structured Course. Well designed case studies and a good trainer. Coding was made really simple with easy to understand examples. Object orientation session has made me strong in understanding the limbs of every scenario. Overall, some good learning! Thanks, Sami. Awesome Course! Concepts were made simple to understand. Automation is real fun now. Thanks to my tutor. It would be great if you could send us few more case studies as we had a challenge taking up a project. Sami is truly a passionate trainer, who is more interested in learning of his students. The examples taken are in line with the profile of the group. Coding was made really simple and fun to work with. Assignments post the session did its job of reinforcing our learning. In a nutshell, great learning! The course is structured and delivered really well. The majority of our group was from the non-programming domain and hence, relating to new concepts was challenging. But, Sami made coding look so homespun. Case studies were good, exposing us to the application of the concepts learned. Every good course structure requires an expertise trainer to suffice the beauty of the subject and Sami, is just apt for this VBA course. His equal knowledge on Macros and the industry exposure at different levels made his teaching a child's play. The best part of him is, the passion towards teaching in a simple language making us so comfortable with the subject. Sami, your training is absolutely magnificent. I have started doing full-fledged automation. Loving it. Thank you! This has given me a hands-on experience of real-time automation. It has placed me in a better position to evaluate and trouble shoot problems much faster and better. It was indeed some good learning! Sessions were highly informative with loaded tips here and their by Mr.Sami on remembering concepts and implementing it back at work. I really enjoyed Assignments session which truly boosted my confidence in Automation.. The thorough-ness in your knowledge about the steps to be followed and the examples that you pick up is spell bounding. The error-identification is the best in your blood, that is, when i am bewildered about my mistakes, you solve it like a childs play, which gives me lots of confidence in dealing with such mistakes in future. It is not only in class, but also over phone when you might have been in a different/difficult situation all together. The Clarity of communication and the thought of yours gives me the same capability as well in doing so with my colleagues at work. The passing-on of the legacy is appreciableI am thoroughly confident and in a position to teach my subordinates at my work place on the knowledge gained from you in Excel. The entire support & co-ordination towards Excel Training Course is really appreciable. It was a clear, precise and practical oriented class conveying the most complex formulas in to the best easiest way. The Video enabled lessons (Online Excel Help) drafted through online helped us to do a practical revision & to know the various aspects in Excel. Overall we really enjoy our learning experience with Excelgoodies. Indeed, it is my immense pleasure to share my learning experience with Excelgoodies. Before joining this course, I was totally bewildered and frightened to use Excel applications. And being a Senior Project Manager, my job profile strongly expects proficiency in Excel applications. And my search for the good training center landed up with Excelgoodies, which is the "exclusive and unique" institute for giving Excel training. The main highlight in Sami's training is his patience and empathy towards his students. And he never proceed with next session unless everyone in the classroom fully understood the concept. And he completely understands the students need and their difficulties in using various application, which paves way for understanding the concepts thoroughly by the students. I had attended many training sessions, but I feel Sami is the best trainer I have ever seen. After attending all the sessions, my confidence level soars up and I am in the position to clarify even others in the usage of Excel applications, which is a great transformation and I owe all this success to Sami. Also the online tutorial is very useful in learning all the fundamentals of Excel applications and concepts. I strongly recommend Excelgoodies to anyone who wants to improve their proficiency in Excel. 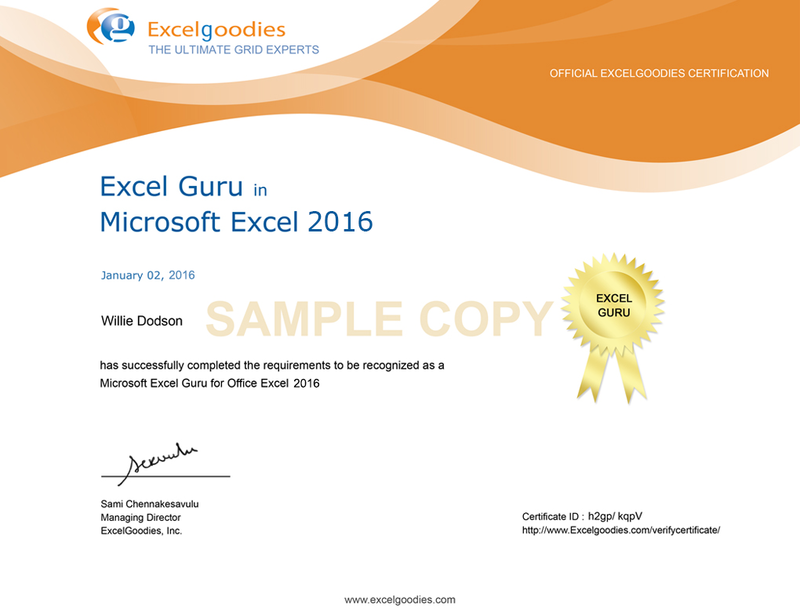 Once again, my sincere thanks for sharing my experience on Excel training in Excel goodies." Your training has really helped me in improving my Excel Skills. Today, I am able to save lot of time at work using the Excel knowledge shared by you. I am creating the templates on my own which has reduced my data entry work, using v-lookup effectively have reduced my data search, using count-if, sum-if I am able to do wonders with Excel. Thanks a lot Sami ! It has been a complete pleasure in knowing you as well as the whole team at Excel goodies. 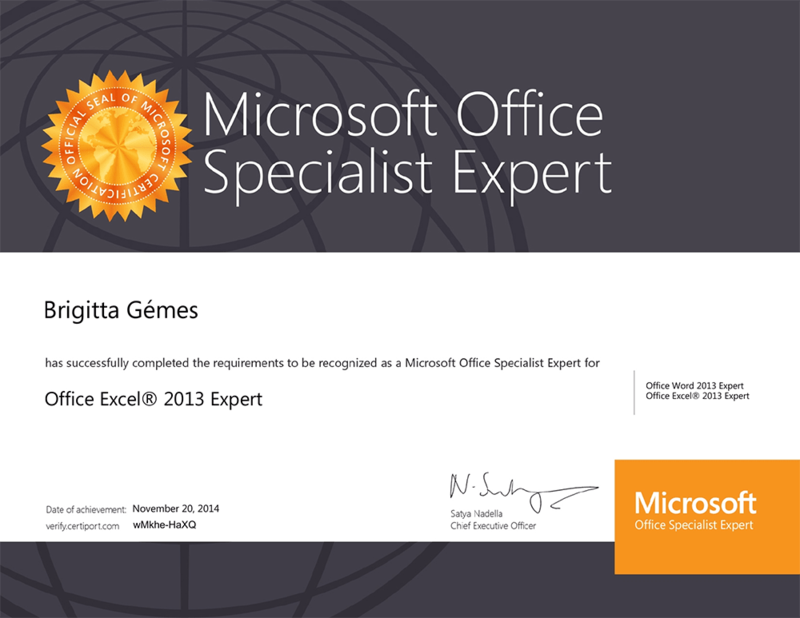 Excel Goodies and the training provided have provided a huge impact in my confidence in which i approach MS Excel. The training was very good and what i liked the most was the patient teaching and doubt clarification sessions.Also the amount of personal attention to each student was also great.I have attended training for other courses like SAP,etc.By far my classes with you have been the one which has given me the most satisfaction. Also,the service and after sale service by the Excel Goodies team has been superb.There are many places who just don't care about the students after the fees has been paid.Excel Goodies stands out from these profit oriented institutions. Its been more than 2 to 3 months since my classes are over but still the support by you and your team has made me more happy to be associated with excel goodies. I would like to once again wish all success to you as well as Excel goodies. There are certain trainees who train's people in class ! But the way sami trains, will make's you also an Trainer ! That profession comes naturally for sami (his forte)! He make's us to think professionally ! The best thing i can do for sami is to send & recommend more people for the training ! He is Guru Dronacharya who makes more Skilled people like Arjuna ! Advance wishes to you sami ! After undergoing this training, the things which I use to take 15-20 hrs, now I am able to do it in just couple of minutes. It made me to understand the importance of structuring the worksheets, organizing it and you have some wonderful analysis in your hand. Very good trainer, clear, precise and to the point. His knowledge on various processes in different areas gave us big time exposures on the real time applications on excel. Good learning environment. As a trainer I think you have done an excellent job as you have been able to teach some of the most complex scenarios in excel is a very simple to understand way and have also provided us ways in which to refer back to what was taught if at any point in time it actually slips our mind for not using a particular formula etc. I really appreciate the training you provided as it has immensely helped me in my job. Thanks. I really enjoyed and learned a lot with your excellent training in a short period. Really it helped me a lot in my work place. Thanks a lot and wish you all the best. Hi Sami, Just wanted to say thanks for setting up these great courses. 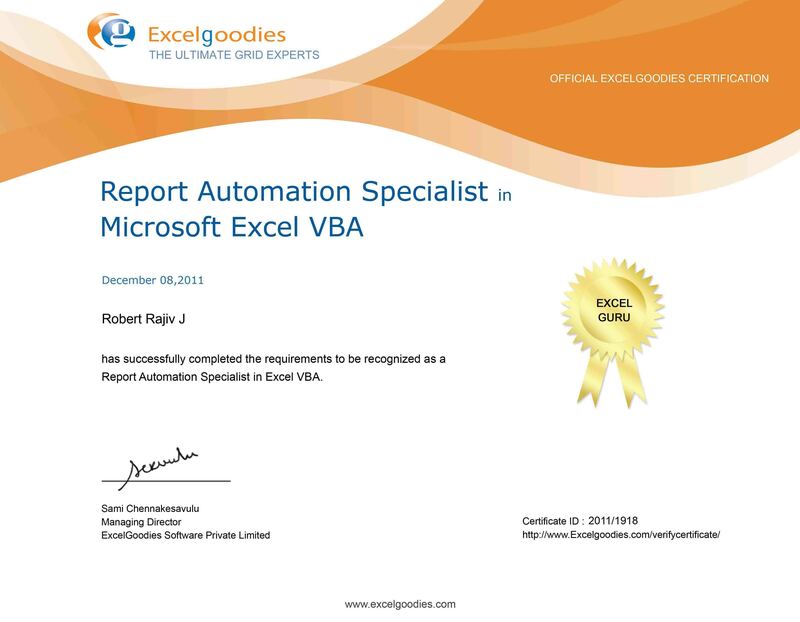 The Excel VBA class was great, its helping me to automate a great deal of tasks at work and learning Access has been good as well. The course was well paced dealing with the practical use of Excel. Concepts were made pretty simple to understand as well as to remember. Thanx to Sami & Team Excelgoodies. Thank you Sami, for clearing my all excel related doubts with so much of patience and also teaching us with ample shortcuts. Would like to share with you that, I am now using Excel to the most possible extent at my job. I enjoyed the Corprate level of training and now I feel so confident to handle any amount of data at work. Thanks to Sami & Team Excelgoodies ! Sami, You are an excellent tutor. You taught us all the key things that we need to know about excel and explained it very cleary and gave enough time to practice it at the time of training itself that actually helped us a lot. The training was excellent with examples of simple logics. This is really helping me in my day to day work to save time. Thank you for the same. Thank you for making me feel so comfortable in training!